Surprising effective power of Air-Catalyst | SELFEEL | Products | NICHIRIN Chemical Co., Ltd.
Air-Catalyst SELFEEL decomposes toxic substances that cause sick house and sick building syndrome.It is also a deodorizing, anti-bacterial, anti-fungal and anti-staining agent. SELFEEL is a clear, colorless and odorless solution made from natural mineral compounds derived from the earth. *NOTES : Air-Catalyst is a trade mark of Nichirin Chemical Co., Ltd., Japan. SELFEEL works on the principle of decomposing toxic substances as a catalyst. Potassium 40 (40K) acts on atmospheric water molecules to generate Hydroxyl Radicals (･OH) and Hydrogen Peroxide (H2O2). Hydrogen Peroxide is transformed into Hydrogen Radicals by the Fenton reaction using transition elements such as iron and titanium contained in the SELFEEL formula. Additionally, Superoxide Ions (O2-) are generated from atmospheric oxygen and Hydroperoxyl Radicals (･OOH) which is also produced from Hydrogen Peroxide. Superoxide Ions contribute to the SELFEEL process. The oxidation properties of SELFEEL are effective against bacteria and fungi. The reactive process kills bacteria and inhibits the growth of fungi. SELFEEL generates Hydroxyl Radicals from the atmospheric water and Superoxide Ions from the atmospheric oxygen, and these radicals play an important role in the SELFEEL function. After the function is accomplished, these radicals return to water and oxygen, and go back into the atmosphere. The returned water and oxygen are used in the SELFEEL function, again. SELFEEL has been named "Air-Catalyst" because SELFEEL uses circulating air and atmospheric water and oxygen for the SELFEEL effect. A catalyst makes a chemical reaction occur which would not take place under normal conditions. The chemical reaction happens quickly without anyalternation to the catalyst. For example, titanium dioxide, a photo catalyst, decomposes Formaldehyde into carbon dioxide and water. 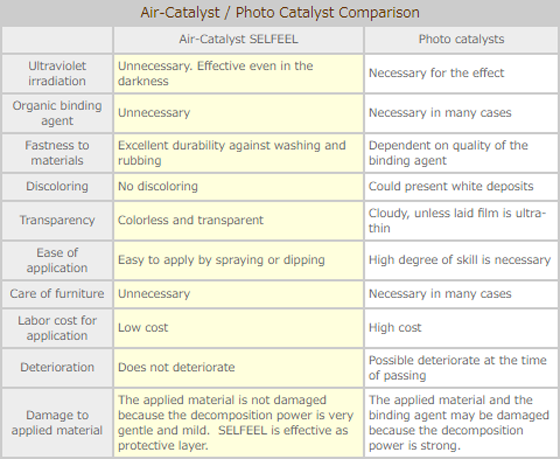 A photo catalyst and the Air-Catalyst SELFEEL have similar properties. The significant difference between a photo catalyst and the Air-Catalyst is the need for sunlight (UV rays) in order for a photo catalyst to function. The Air-Catalyst SELFEEL functions continuously around the clock. It even works in places where sunlight is lacking such as the inside of buildings, basements and closet. The only requirement for the Air-Catalyst SELFEEL to function is air flow and continuous surfaced exposure. In general, photo catalysts have stronger decomposition power than the Air-Catalyst whenever and wherever sufficient sunlight (UV rays) energy is present. However, indoors where sick building syndrome is predominant, photo catalysts are not able to perform to their full potential because sunlight is absent. The Air-Catalyst SELFEEL performs in environments where sunlight is lacking, and at night when there is no sunlight. Additionally, the strong decomposition power of a photo catalyst can damage the material to which it is applied. SELFEEL decomposes toxic substances without damaging materials because the decomposition power of SELFEEL is very gentle and mild.